Recently I found an unexpected treat--Indigo Aviary. 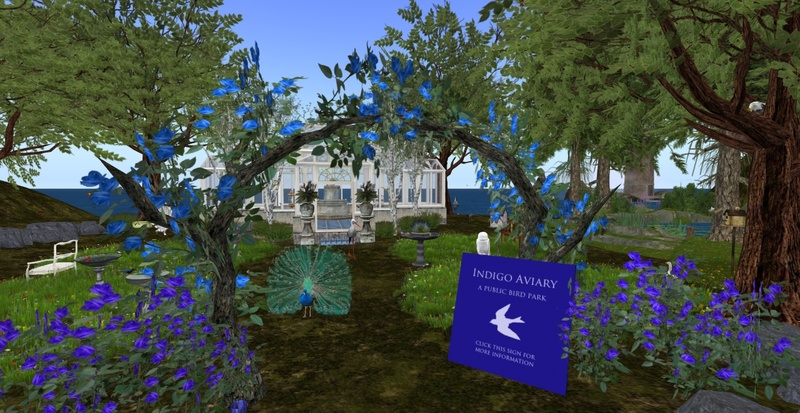 Located at Ctrl Shift H (213, 97, 22), Indigo Aviary is a lovely park owned by resident Owly Indigo. A wide variety of SL birds can be seen here, from hooting owls and strutting peacocks to the authentically reproduced Yellowhammer and Indigo Bunting. A few, like the huge Turmit, a Gorean fantasy bird, are only found in Second Life. At the landing point you walk through a blue rose arch, created by Uni Ninetails, to go into the Aviary. Visitors are greeted by hoots, chirps, and squawks. Note cards are available at the sign, and anyone who wants to help support Owly’s pixel birds will find a donation box nearby. A few days ago Owly Indigo and I talked about her fascination with birds. In real-life she is a serious, amateur birder. She keeps binoculars and a bird ID card in her car, and instead of a gingerbread house, she and her family made a birdseed house for the holidays . Grey Lupindo: Thanks for meeting with me. This is a lovely park. Owly Indigo: Thank you! (smile) It was fun to put together. Grey Lupindo: What gave you the idea to focus on birds? Owly Indigo: Well ... 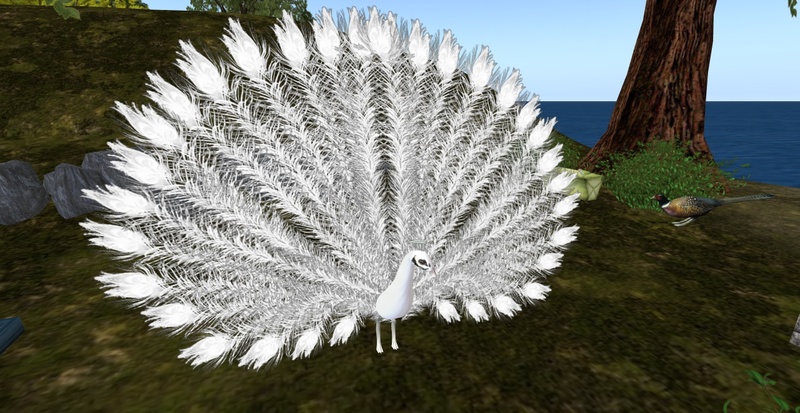 I used to have a blog that focused on birds in SL. Kind of like a birder's journal ... “I spotted this bird here, and that bird there.” I wrote about birds like the ones here, bird avatars, bird costumes, bird jewelry, furniture ... pretty much anything with a bird. That blog was active for 3 years. I haven't done anything with it in a few months ... but in the meantime, I was collecting all these pixel birds! Grey Lupindo: Your note card says you have over 100. Is that a current number? Owly Indigo: I would have to count again ... but yes, more than 100 here on this side of the hill, and a few more on the other side where my house is. Grey Lupindo: Can you tell me about your first SL bird? Owly Indigo: Oh, yes. It's in here. This Great Horned Owl from Animania. Owly Indigo: I had named myself Owly because I love owls ... and when I first got some land in SL, I wanted two things: an owl and an olive tree. And here he is. (grin) It exploded from there. Grey Lupindo: He looks very realistic. Owly Indigo: Most of the birds here are realistic, but I enjoy the cartoon ones too. Grey Lupindo: Is he your favorite here in SL? Owly Indigo: Oh dear ... hard to have a favorite. (Owly Indigo looks around.) Can I say all of them? Owly was quick to tell me that she has not created any of the SL birds found at Indigo Aviary. The same disclaimer is written on the notecard that is provided to visitors. Owly’s honesty is refreshing since content creators often have to worry about others claiming credit for their work. I asked Owly if she had a favorite creator. Owly Indigo: Several-- Animania, Sculpty Creations, SHD (Spiky Haired Dragon), 2Xtreme. They really are the best ... there is a reason you see their birds all the time! Grey Lupindo: What do you look for in a SL bird? Owly Indigo: I want it to look pretty close to real ... natural. It's great if it has different animation features - like flying or perching or what have you. And if it has sound, that is another bonus. There is a dark-eyed junco here. I asked Mosley Sperber to make one, and he DID ask for suggestions. It took him a while because he was trying to find the right sound file! Grey Lupindo: He's great, isn't he? Owly Indigo: Oh my God, I am his creepy fangirl - but he doesn't know it. Grey Lupindo: He might if he reads SL Newser. Owly Indigo: I was so impressed that he took the time to find the right sound for the bird, you know? He didn't do it halfway. Grey Lupindo: Yes, I know what you mean. Owly Indigo: Something I've learned in SL is that the goreans LOVE their birds. There are gor-specific birds like tarns and vulos and turmits, but they also have chickens and geese and gulls. Grey Lupindo: Looks like you have swimmers, fliers, a little of everything. Owly Indigo: That's what I've tried for ... a smattering of things. And I have more in inventory ... just not the prims to set them all out. Grey Lupindo: How long have you been at this location? Owly Indigo: More than a year, but I didn't really consider the aviary "finished" until August 2011. The aviary was in the destination guide Sept 2011. I did a small version of the aviary for SL7B, and I had it in a different form when I lived on another sim. Grey Lupindo: Do you have any expansion plans? Owly Indigo: My dream is to have a homestead sim all to myself so I can REZ ALL THE BIRDSSSSSSSSS! But no immediate plans to do that. (laughter) Actually, I'm planning to downsize my house to make room for birds that have yet to be made . Grey Lupindo: You are dedicated. Owly Indigo: I love having them all out. Grey Lupindo: Do you have an idea of how much you have invested in them? Or would you rather that I not ask that for publication? Owly Indigo: I don't mind that you asked ... but I actually don't know ... and I think I would probably be horrified if I did know the actual number! Owly said she has met a lot of great people in SL, including Cicadetta Stillwater, who resides in Italy in real life and researches birds. Others are amateur birders or bird-owners. Anyastasia Szaberwick, who has a pet cockatiel in real-life, gave Owly a gift of a cockatiel because there wasn’t one at Indigo Aviary and Szaberwick loves them. While we chatted Owly rummaged through her inventory and found two bird avs, a Magpie and her namesake, an owl. She changed into them and danced around, looking adorable. 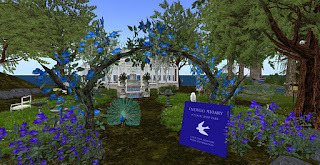 Though not a content creator, Owly has created a place that brings her real-life passion into Second Life, and she generously shares this special place with the rest of us. Did you know you can shorten your long urls with OUO and earn dollars for every click on your short links.